Government agencies go online to get message out, reports Duan Yan. China's 457 million Internet users are now able to do more than follow pop star's micro blogs for news about their next concerts or romantic breakups. Thanks to a test-run of new media platforms, they can now keep tabs on government agencies. The government's first app for the iPad, from the State Council Information Office (SCIO), became available on April 6 and was downloaded more than 20,000 times in the first three hours, said chief developer Ling Chen. The free application, available from Apple's App Store, targets the more than 15 million iPad users worldwide. Last month, Zhang Chunxian, Party chief of the Xinjiang Uygur autonomous region in Northwest China, attracted 100,000 subscribers to his micro blog in its first 24 hours. Zhang, who composed the posting, is the highest-ranking official to open a micro blog under his real name. Officials are beginning to use new media for a variety of tasks, from promoting the national image abroad to listening to public suggestions at home, even for exposing their own wrongdoings. Scholars of public administration say officials still need more training, however, because many are ill-prepared for both the opportunities and the challenges posed by new media. SCIO's iPad app, which aims at both foreign and domestic users, offers about 25 white papers in Chinese and English, and 20 videos of previous news conferences, the most recent one in January. In addition, two videos promote China's image abroad. One of them played 300 times a day earlier this year on a large screen in New York's Times Square. Besides outdated videos, the app also provides live broadcasts of CCTV's international channel. However, user ratings on the App Store were running negative on Sunday afternoon: 22 of 38 gave the app only one star; 13 awarded the full five stars. There were 38 votes and 17 reviews. "There are so many functions we can add in the future, such as conference registration and notifications, as well as question submissions for reporters," Ling told China Daily. "We were also thinking about adding more videos and travel information about different provinces, making it look like a magazine." Ling is a senior project manager from CNTV, an online station launched by China Central Television, who led the app's development. He said there wasn't time to work those features into the app's initial version. "Of course, the most important things are included, which are the white papers and news conference videos." Ling's team spent months collecting the white papers, which were published by different ministries in different digital formats, and changing them into a format for the iPad. "Some are in PDF format, and some are in Word format. All of them needed to be proofread. It's a very time-consuming process," Ling said. Ling and his team looked for similar apps to study before they started working on the SCIO project in December, but found few. But Ling did notice one, for the Information Service of the Hong Kong Special Administrative Region, that is available for both iPad and iPhone. There won't be a SCIO app for mobile phones because it would be too difficult to read the white papers on a small screen, said a SCIO official who wanted to remain anonymous. "There have been about 60 to 70 white papers published since 2005, and we want to have them all put in the app in the future," the official said. "Also in the future, we will be able to have the most updated news conferences on the app." James Rogers, a businessman from the United States who lives in Beijing, read the introduction to the SCIO app on the App Store. "I think a good government app would be one that provides raw statistical data that you can access and download," he said. Rogers owns a small company in the clean energy market, and he looked for data on China's energy sector while researching Power Currency, a book he published in December. "It's an open-minded move, and good to promote our national image abroad," said Gu Jie, vice-president of Wuhan University of Science and Technology. She welcomed the app, saying government is getting more creative and willing to use new technology to reach out to its audience. Government agencies also are opening up domestically. According to a recent report published on the People's Daily website, more than 2,000 micro blog accounts had been set up by government departments at Sina.com. Sina.com is one of China's biggest micro-blogging service providers. Among these accounts, a large portion were opened by public security departments. 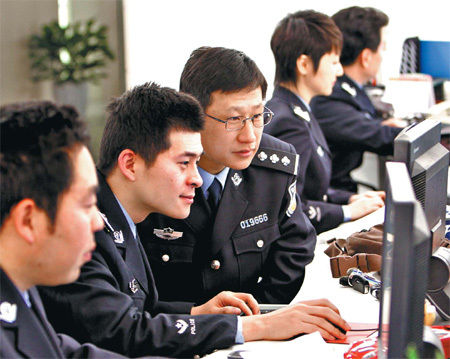 In January, the Ministry of Public Security published on its website that more than 800 micro blogs had been opened by local departments and that many were very actively posting public security information as well as answering questions posed by Internet users. Gao Hongcun, a professor at Chinese Academy of Governance, has been teaching local government officials about the use of new media. Gao thinks the application for iPad is just one of many efforts being made to build more channels for effective communication. As of May 1, 2008, the State Council required government agencies to release information online if it involved the public's vital interests. The requirement is regarded as a way to make government work more transparent. However, a report assessing government websites in 2010 showed that about 78 percent of 450,000 users surveyed online were "very unsatisfied" because the sites did not provide what they were looking for. Many responders described the information on the sites as outdated, impractical and irrelevant. The survey was conducted by China Software Testing Center under the Ministry of Industry and Information Technology.